In another PR masterstroke, Glasgow City Council have chosen the two hottest days of the year to unveil a draconian clampdown on outdoor seating in the city. Although not an official change in policy, what has been described as a “shift in approach” will require venues putting a few seats on the pavement to obtain full planning permission, incurring an approximate £400 fee and hundreds more in legal costs. Coming right at the start of the school holidays – and coinciding with a heatwave – the measure is already being viewed as yet another attack on public space by the council, following a series of controversial decisions recently. The move also comes just weeks ahead of the demolition of one of the most popular spaces to sit down in the city centre, the Royal Concert Hall steps. Then again, it’s perhaps not surprising that they’ve declared a war on outdoor seating areas, given everyone knows how much they love a good walk. It was over a decade ago that the council hit upon the idea of “cafe culture” in one of their never-ending efforts to redefine and rebrand the city centre. This was supposed to bring a Mediterranean style atmosphere to the city centre or something, a bit like how the Commonwealth Games were supposed to single handedly turn Glasgow into a city of fitness fanatics, or how randomly announcing 2015 as ‘Glasgow Green Year’ is meant to compensate for all the motorways they have running through the city centre. Of course, the council’s obsession with rigidly enforcing an arbitrary and draconian licensing regime soon saw off any notion of cultivating a “cafe culture”, and countless outdoor licenses have been refused since, not to mention a cut-off point of 10pm for serving alcohol outdoors. Once again, the council seem to have taken an entirely bureaucratic decision that benefits no one. On the 10 days each year when it’s actually nice enough to sit outside, pavement seating adds a vibrancy and buzz to the city that – you would think – would surely be welcomed by council grandees given their obsession with external appearances. Alas, their other main hobby of enforcing pointless licensing laws has triumphed in this case, and the main losers are – yet again – ordinary people and small businesses in Glasgow, who will likely lack the resources to go through a complex licensing process just to stick a few seats outside. 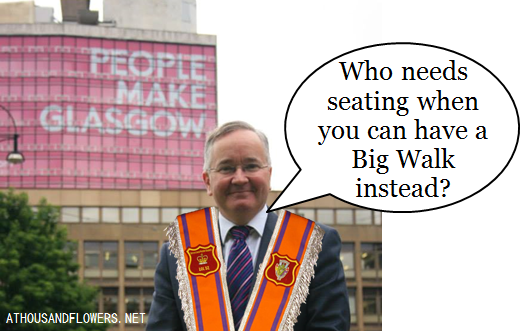 Well done, Glasgow City Council. After forcing The Arches to close and pushing through the demolition of a popular civic space – the Royal Concert Hall steps – and approving its replacement by a behemoth shopping centre that will dwarf the city centre and ensure the demise of Sauchiehall and Argyle Streets, we wondered what they would next have up their sleeves. 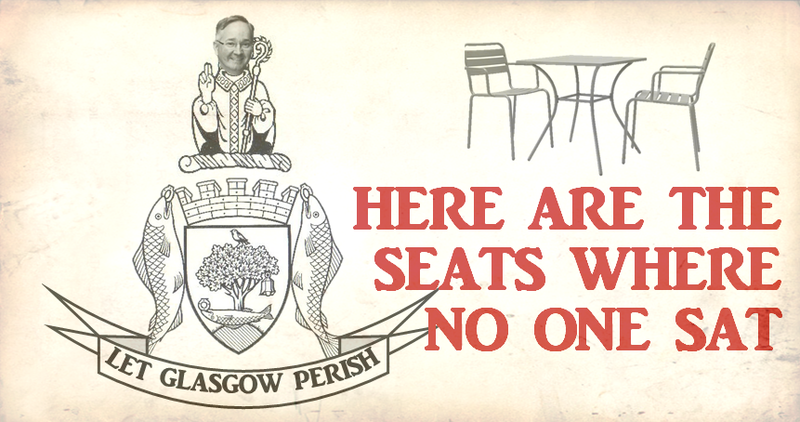 With the fractious ruling Labour group currently in a state of civil strife over Gordon Matheson’s decision to run for Scottish Labour deputy leader, at least their war on outdoor seating will give them something to unite around. 2017 is not that far away. I suspect there will be a vote towards councillors with a more progressive attitude.